Seven car makers (Audi, BMW, Daimler, Ford, General Motors, Porsche and Volkswagen) agreed to introduce CCS in mid-2012. The prototype implementations for up to 100 kW were shown at EVS26 in Los Angeles in May 2012. 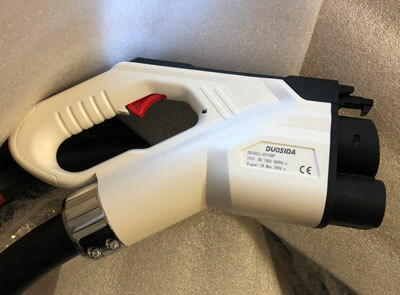 DC charging specifications in the IEC 62196-3 draft give a range up to 125A at up to 850 V and have since been increased to 200A. 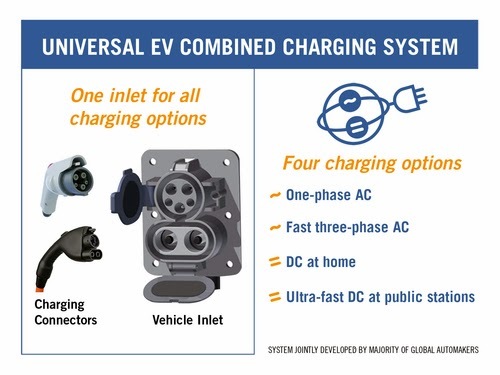 This was a direct confrontation with CHAdeMO which had been in existance for several years and had extensive charging stations thur out Japan and had started to install them in the US. This is the Inlet with 1m of wire, lots of wires... Here is the front of the Inlet. 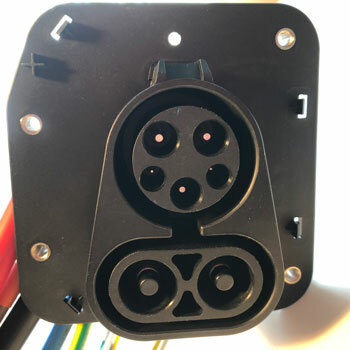 The J1772 inlet works alone with any Level II EVSE. These are the HV wires, 2 HV and 4 sensor wires. 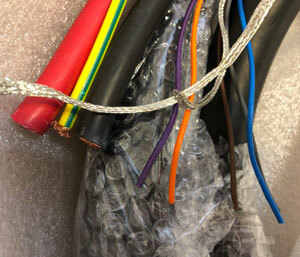 The 2 HV wires, black and red, are marked - "EV Cable 50mm2 125degC 450/750V"
These are the Level II, J1772 wires. 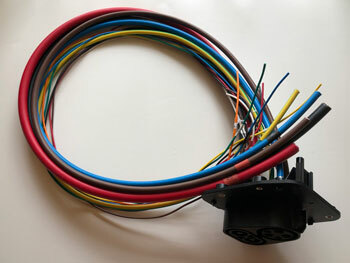 The brown (L) and blue (N) are marked "EV Cable 16mm2 125degC 450/750V". 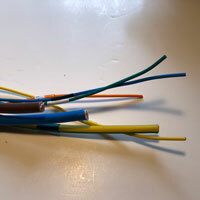 The green/yellow (PE) is marked "EV Cable 10mm2 125degC 450/750V"
The 4 smaller wires are 0.75mm2, green (CP), blue (PP), yellow (WK5) and orange (WK6). 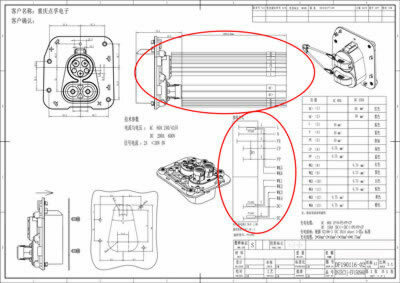 The CSS Inlet has 3 heat sensors in it that are designated PT1000 on the spec drawing. If you google PT1000, you get a website that says "Pt1000 sensors are the second most common type of platinum resistance thermometer. Often resistance thermometers are generally called Pt1000 sensors, even though in reality they may not be the Pt1000 type. Pt refers to that the sensor is made from Platinum (Pt). 1000 refers to that at 0°C sensor has a resistance of 1000 ohms. " Here you can see where the sensor wires (the original colored wires transition to the OEM wires of the sensor). The other sensor is on the red wire and is hidden. Each of the HV wires has a PT1000 sensor. 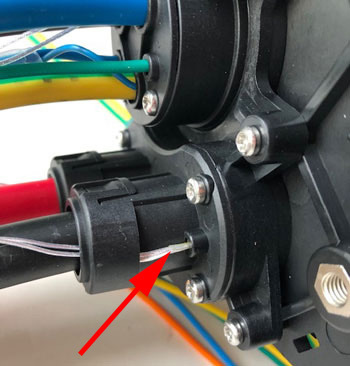 And here the arrow shows the wires to the single sensor in the J1772 part of the inlet. The sensor does double duty on the J1772 side. Here's the 2.7k ohm resister between the Proximity and Ground (black arrow). You can see the green ground wire (red arrow) going into the clear heat shrink protection over the resistor. 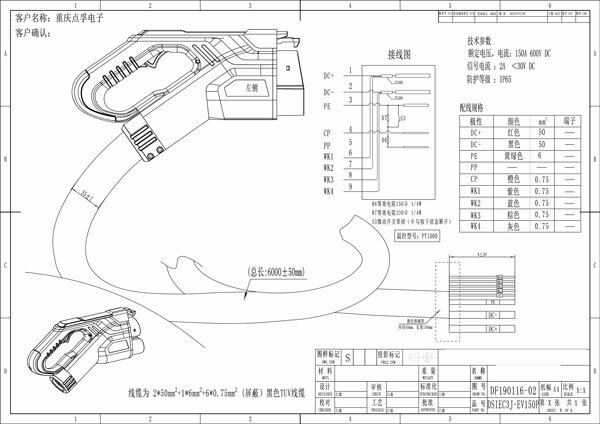 This is the spec drawing that shows the various wires and their designation. Oddly they have the green as the Pilot (CP) signal wire and the blue as the Proximity (PP) signal wire for the J1772 compartment. 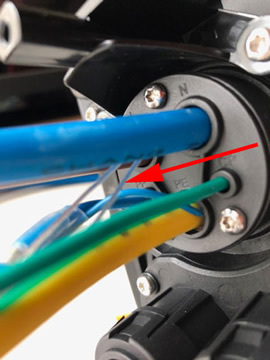 The Plug has the ground (green/yellow) and Pilot (orange) wires but like with the J1772 Spec, no Proximity wire goes from the Plug to the EVSE. The Proximity circuit with the 150 ohm, 330 ohm and diode is incorporated in the latch switch. 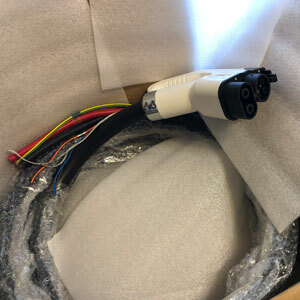 There are also 2 - PT1000 sensors, wires WK1 (purple) and WK2 (blue) are for the HV+ (red) and wires WK3 (brown) and WK4 (grey) are for the HV- (black). 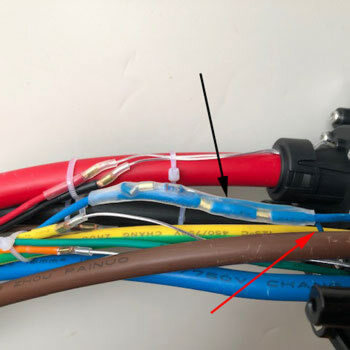 Wire AWG are similar to the AWG of the respective wires in the Combo1 Inlet above. 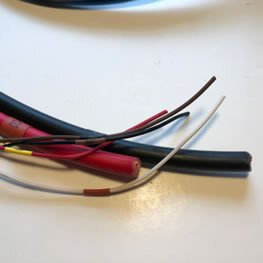 There are also 2 braded shielding wires for the signals from the plug head.